Costia is a parasite that is single celled and thrives in cold water. It will multiply quickly in this environment and can cause considerable harm to any fish it comes into contact with. It is considered a protozoan flagellate as it contains a minimum of two appendages named flagella which extend from the cell. These are used for feeding and transport. These parasites will attach themselves to the gill and skin membrane of fish. They achieve this through burrowing inside the epidermal cells, where they will consume the content. In small amounts, Costia doesn’t cause any harm, but becomes dangerous in larger quantities. A fish whose immune system has been compromised is vulnerable as this can result in an increased presence of Costia, and poor quality of water is considered the leading cause of immune system deficiency in fish. Costia may cover the entire fish or it may merely affect certain patches. Overall, the infection level is dependent on the strength of the fish’s immune system. Once Costia reaches the gills this is when a fish is in greatest jeopardy. Costia frequently appears in spring when fish tend to be weakened due to winter hibernation. The speed at which Costia spreads is dependent primarily on temperature. It reproduces fastest at temperatures ranging from 50 degrees Fahrenheit to 77 degrees Fahrenheit and will be destroyed at temperatures higher than 86 degrees Fahrenheit. At temperatures lower than 46 degrees they will behave like cysts and must find a host once returning their normal state or they will not survive. Costia is a tricky disease as it can resemble the symptoms of other conditions such as chilodotiasis or trichodinosis. This parasite is extremely small, between eight and fifteen micrometers, which means that it can be very difficult to confirm a diagnosis without collecting scrapings and analyzing them beneath a microscope. Even then, you have to know what to look for. 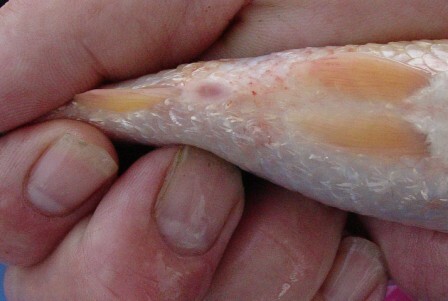 Fish which are afflicted with Costia may also display appetite loss, red patches, clamped fins, mucus near their gills, twitching or slimy patches. There are a number of ways in which Costia can be treated, but one of the most effective and affordable is with salt. This method is most gentle for the fish, especially goldfish which can handle higher salt levels in the water. When using this method it is best to start with between three and four grams of salt per liter. This should be sufficient unless the Costia has begun producing strains which are salt resistant. Another method of treating Costia is with Formalin. This is the best option in situations where the parasite has become resistant to salt. You will want to use fifty parts per million for about 2 hours and then change fifty percent of the water. This sequence should be repeated two more times. Hydrogen peroxide is another substance that can be used to eliminate Costia. It is most ideal for bigger fish with patches. You can soak a cotton bud in the solution and then dab the areas that need to be treated.